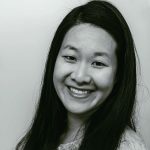 Published Jan 22, 2019 By Julia 3 CommentsThis post may contain affiliate links. 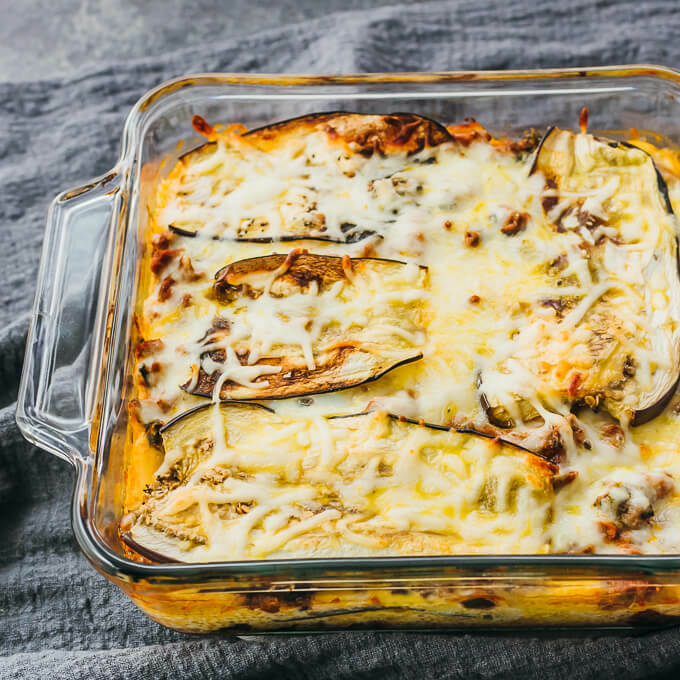 This eggplant lasagna has layers of cheese, eggplant slices, and a rich meat sauce with spinach. 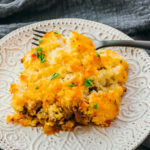 It’s a comforting casserole dinner that’s keto friendly, low carb, and gluten free. 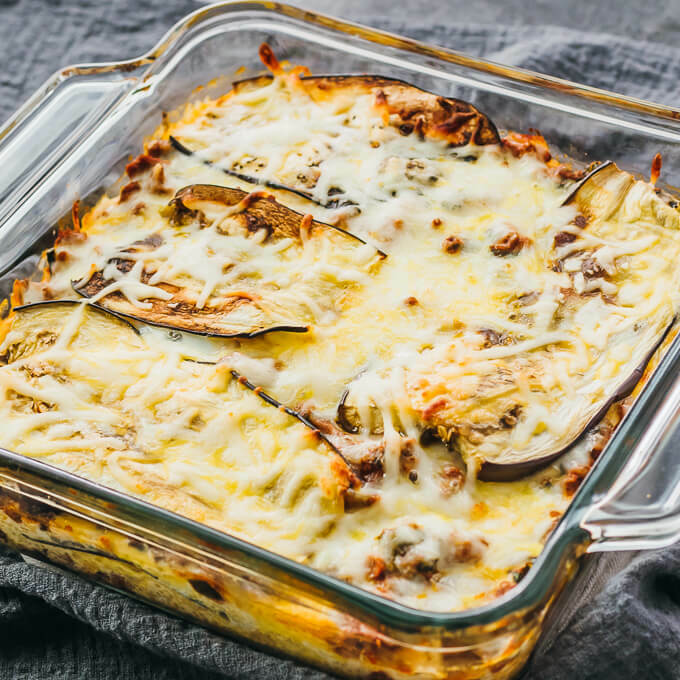 This eggplant lasagna is adapted from my zucchini lasagna recipe. 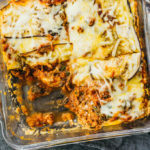 Both dishes have no lasagna noodles and are layered with cheese and a flavorful tomato-based meat sauce. Trust me, you won’t miss the noodles at all! This recipe takes a bit of effort to roast the eggplant slices and cook the meat sauce, but the end result is well worth it. It’s also hard to mess up. 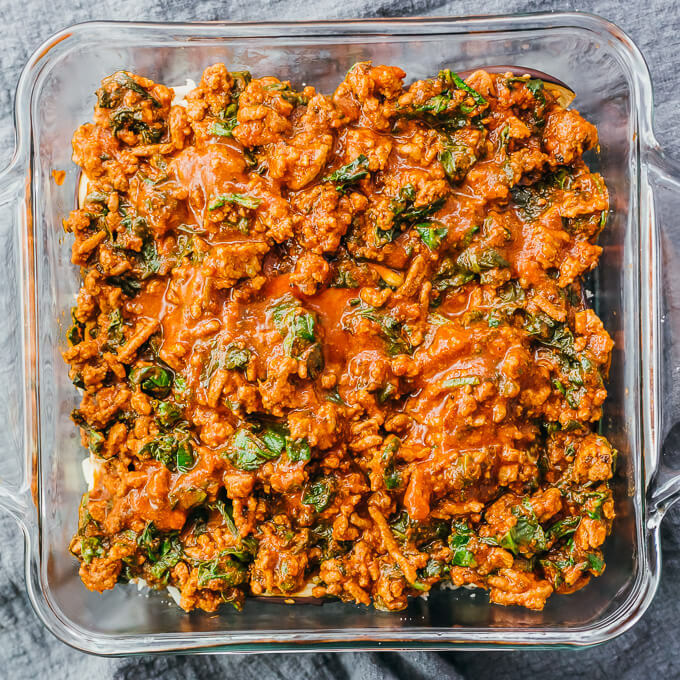 Eggplant, beef, tomato sauce, spinach, herbs, and cheese is a winning combination in any casserole. Before slicing an eggplant into thin planks, I start by cutting off both ends. This gives me a smooth and flat surface at either side. Then I place the eggplant vertically, and it’s able to sit stably on a flat base. Carefully, I slice the eggplant into 1/4 inch lengthwise slices as uniformly as I can, until all of the eggplant is used up. I also include slices that are mostly skin. If it’s easier for you, you can start by cutting the eggplant widthwise in half. Your slices will be half as long, but that’s fine if it allows you to cut slices with more uniform thickness. 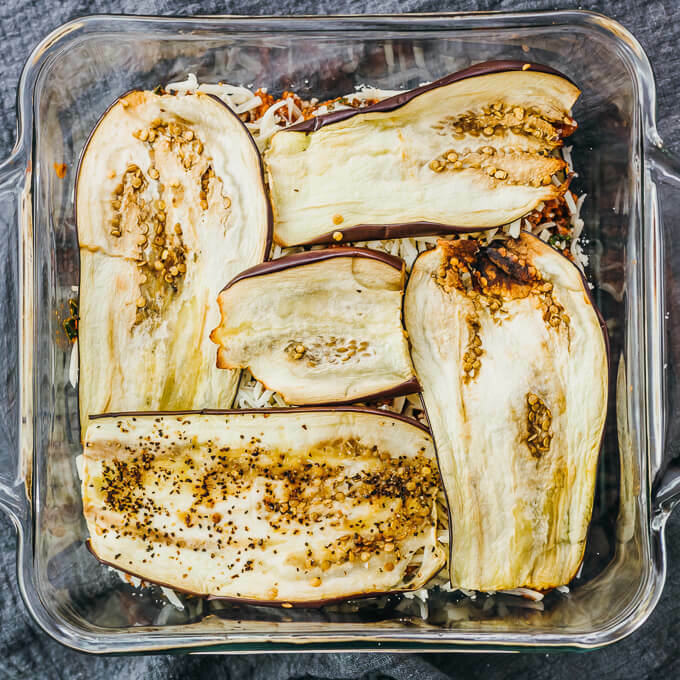 It’s important to bake the eggplant slices separately to soften them, or it would take much longer to cook them in a casserole until tender. The ideal baking time will vary depending on the exact thickness of your slices. It usually takes me about 7 minutes per side. When baking them, monitor frequently so you don’t end up with burnt slices. Even if you do, it’s not a big deal as long as not all of them are burnt. You can still add them to your lasagna. 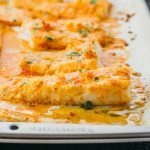 One easy way to make a sub-par lasagna, or any casserole, is to add too much liquid and end up with a soggy version. To avoid this, make sure your meat sauce is thick. Better to err on the side of too thick than too thin. 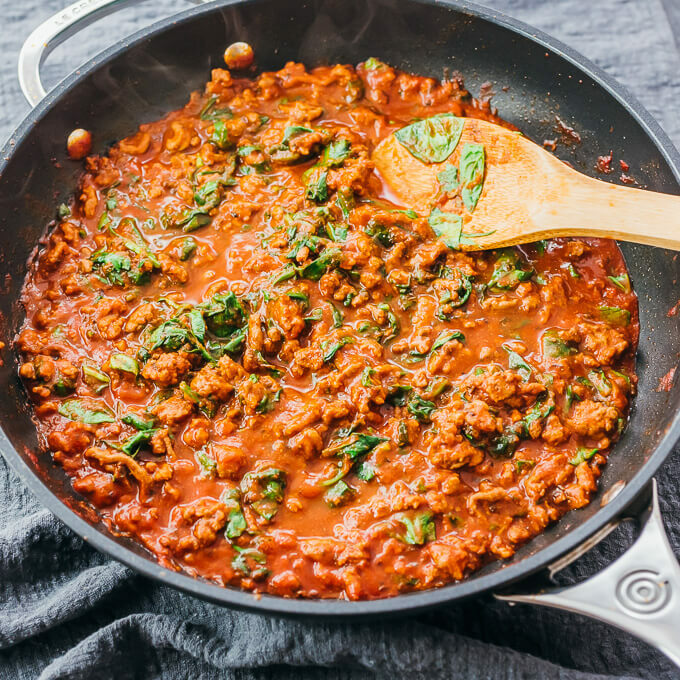 You’ll want to simmer until the meat sauce is noticeably thicker, which can take 5 to 10 minutes. This will also condense the flavors, yielding a richer lasagna. These layers are repeated, followed by any remaining eggplant slices. Then beaten eggs are poured on top, followed by additional shredded mozzarella cheese. You can find a summary of this in the recipe box below, under “Assembling Lasagna” instructions. You don’t need to be very precise; as long as your ingredients are generally separated in layers, the end result should taste delicious. 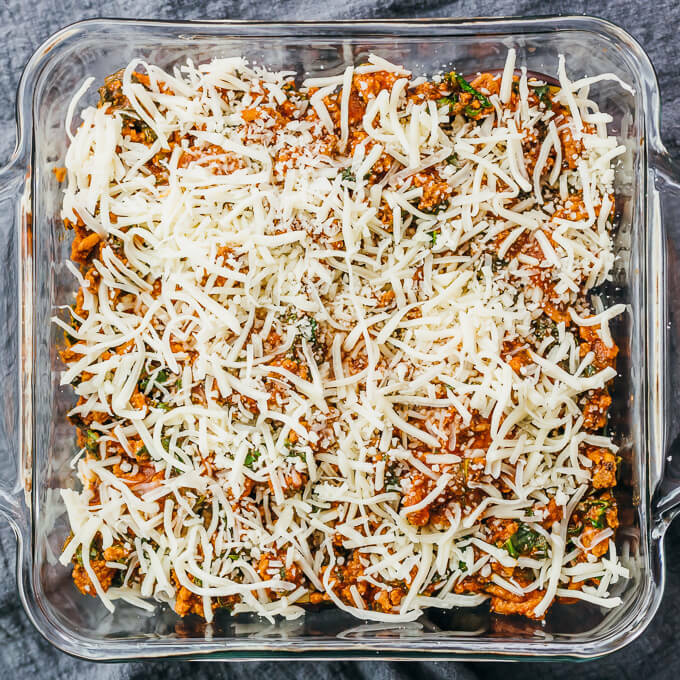 I use an 8x8 inch baking dish made with glass, which I prefer so I can easily see when the lasagna is bubbling up its sides, indicating it’s heated through and ready to remove from the oven. Either 2 baking sheets or 1 extra large one will be needed for the eggplant slices. Otherwise, it will be difficult to fit all of the slices in a single layer. 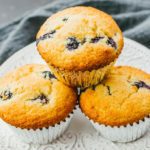 Another option is to bake them in batches. I use parchment paper for lining baking sheets. It’s a nonstick surface that makes cleanup easy. When preparing the meat sauce, I use a large 12-inch nonstick pan. A smaller 10-inch pan will also work if it has high sides. I don’t recommend anything smaller because raw spinach takes up a lot of room. Any leftovers can be microwaved or reheated in the oven until bubbling. 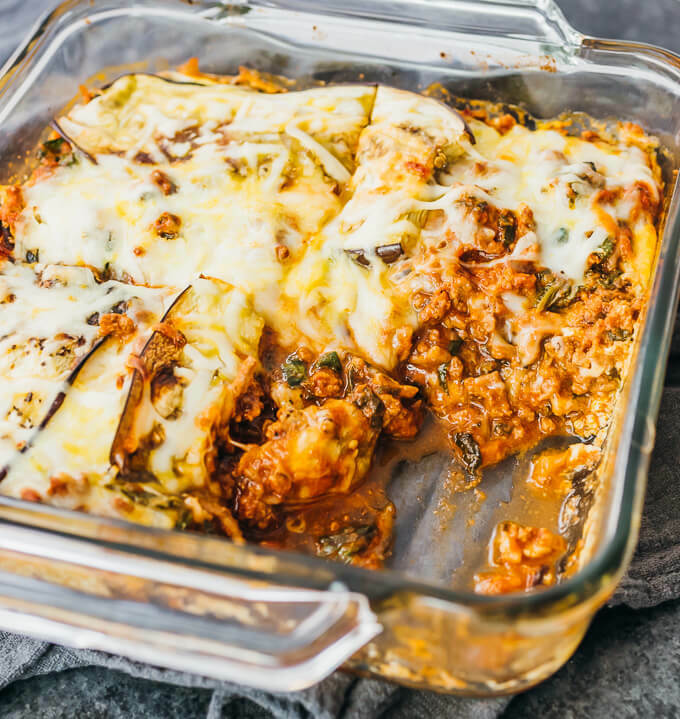 This eggplant lasagna has layers of cheese, eggplant slices, and a rich meat sauce with spinach. 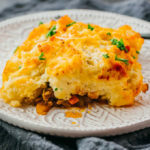 It's a comforting casserole dinner that's keto friendly, low carb, and gluten free. Cut off and discard the eggplant's ends. Cut the remaining eggplant lengthwise into 1/4 inch planks (I get about 14 planks). 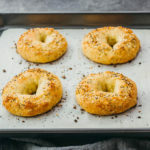 Arrange them on 2 baking sheets lined with parchment paper, or one if they all fit. Brush the tops with olive oil. Season with salt and pepper. Bake at 400 F for 7 minutes, flip the eggplant planks, and bake another 7 minutes. Let them cool while you make the meat sauce. Add olive oil to coat the bottom of a high-sided pan over medium heat. Add ground beef, breaking it apart as it cooks. Cook until browned, about 5 minutes. Add tomato sauce, stirring it in. Bring to a simmer over medium-high heat, then gradually reduce the heat as needed to maintain a simmer. Simmer until the sauce is noticeably thicker, about 5 minutes, stirring occasionally. Add oregano, salt, and cayenne. Stir until well-mixed. Add spinach, cooking for a few minutes until wilted, stirring frequently. Turn off the heat. Prepare an 8x8 inch baking dish. Arrange eggplant slices along the bottom of the dish so that they're slightly overlapping in a criss-cross pattern. Evenly pour about half of the meat sauce over the eggplant. Add 1/2 cup of mozzarella cheese on top of the meat sauce. 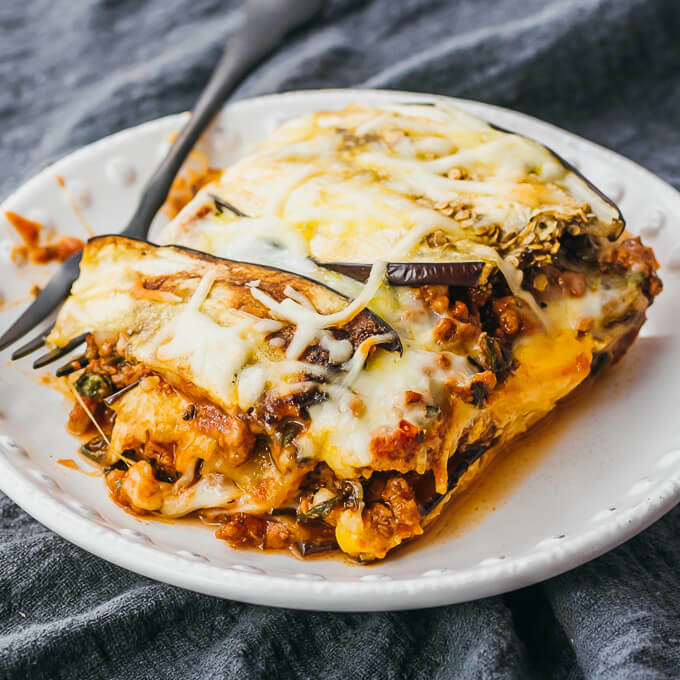 Repeat with another eggplant layer, a meat sauce layer, and a cheese layer. Top with remaining eggplant slices. Evenly pour beaten eggs on top. Sprinkle remaining 1/2 cup mozzarella cheese on top. Bake at 400 F until the lasagna is heated through and bubbling up its sides, about 15 minutes. Let cool for about 10 minutes before slicing into it. 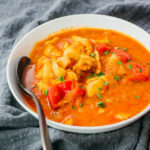 This recipe yields 11 g net carbs per serving (1/4 of an 8x8-inch casserole). Hi Julia, The recipe sounds great until I have to pour the eggs over the top which to me would give it a scrambled egg layer. I am not overly fond of eggs so I think I will leave that step out unless you can give me a logical reason why I need them. lol Thank you for your recipes and taking the time to make them, and answering questions. Hi Leslie! 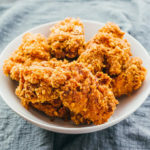 I like the taste and texture with the egg poured on top, but it’s not necessary and you can skip it. Hi Julia, I’m glad you answered Leslie’s question as I am very sensitive to eggs. I would’ve asked the same question or asked if there was a substitute ingredient for the eggs.